The September Madden NFL 19 update is now available and comes in at just over 1 GB in size with updates and improvements coming to nearly every game mode. 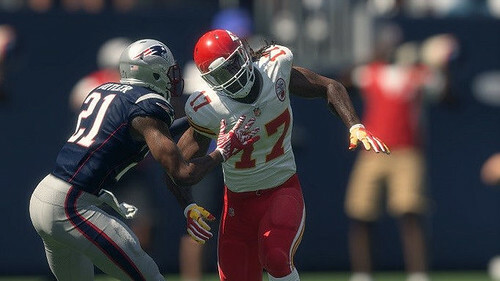 The August game update (1.07) is now available for Madden NFL 19. 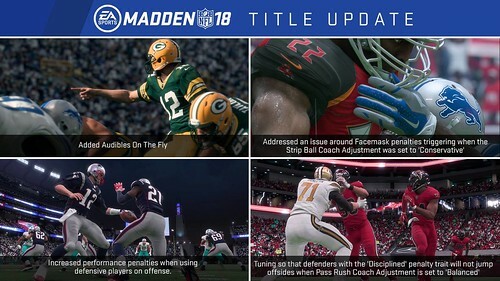 A significant update (over 2 GB in size), it incorporates a new formula for the Hit Stick, blocking upgrades for playaction passes, a new banner displaying player name on off-ball injuries, as well as numerous additional improvements to gameplay, Franchise Mode, and MUT. This update adds new commentary and facescans for players such as Kareem Hunt, Bradley Chubb, and Nick Chubb. 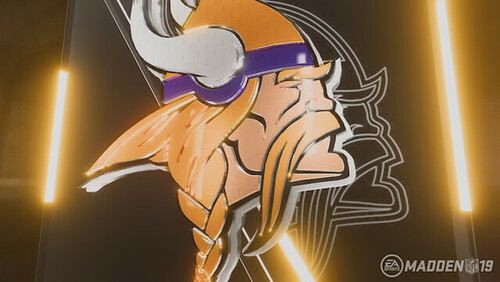 The launch title update is now available for Madden NFL 19. This update addresses numerous issues and items, including one that stoked significant debate and discussion online Thursday and Friday. Colin Kaepernick's name has been unedited and restored to YG's track "Big Bank" on the game soundtrack. Gameplay improvements include the ability for players to hit their top speed faster as well as adjustments to pre-play QB animations. These pre-play adjustments have drawn some scrutiny from those in the community who feel it may allow for an unrealistic number of pre-snap adjustments. 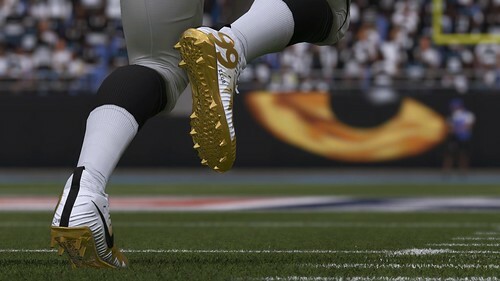 Other improvements include updated facescans for players such as Josh Allen, Lamar Jackson, Jimmy Garoppolo, Josh Rosen, Saquon Barkley, and Tyreek Hill, among others. 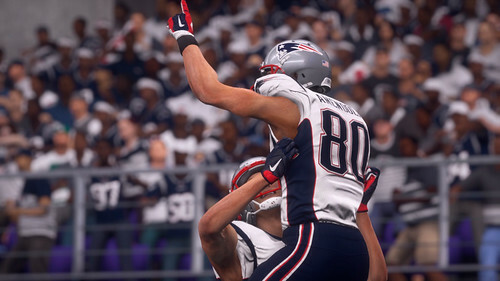 A developer blog and Twitch stream highlights the presentation changes and improvements coming to Madden NFL 19. Presentation improvements are highlighted by the addition of additional stadium exteriors and points of interest, 3D broadcast graphics, improved pregame and halftime flows, updated halftime show, two new replay camera views (Orbital and Overhead), and commentary call-back stories. 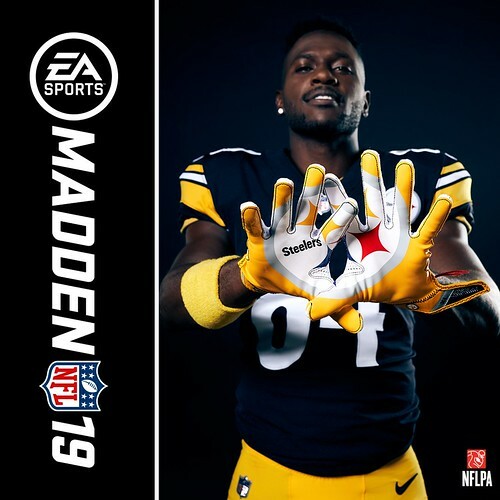 The first look at Madden Ultimate Team improvements in M19 has been released via a blog written by Associate Producer Jake Stein. 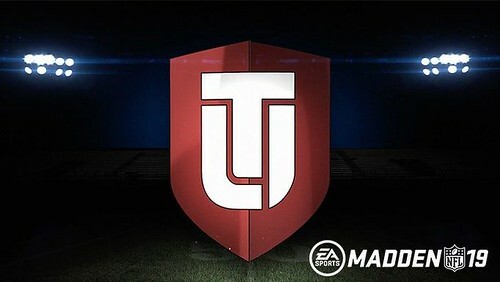 This year MUT focuses on streamlining the player upgrade process by in part improving the UI, allowing the user to select player Chemistry, and added Solo Battles and Squads Challenges, among other changes including the long desired removal of the the contract system. 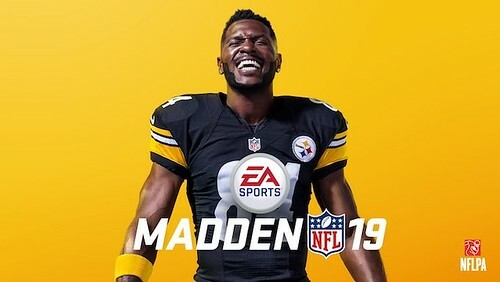 Just ahead of EA Play on June 9, EA SPORTS has begun the news release and marketing campaign for Madden NFL 19 today by releasing the first game info, the Hall of Fame Cover, and release dates. 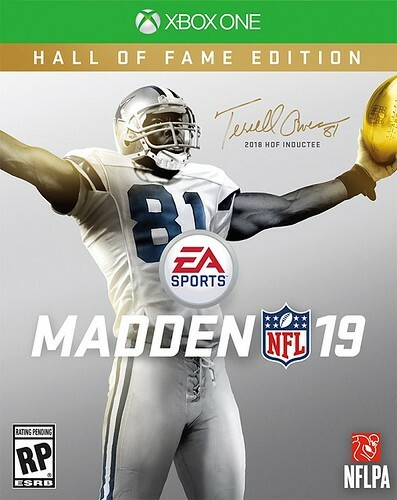 Gracing the cover of the Hall of Fame Edition of the game will be Terrell Owens, a 2018 HOF inductee. Despite spending most of his career as a 49er, Owens will grace the HOF edition as a member of the Dallas Cowboys. The cover athlete for the standard edition will be announced at a later date. 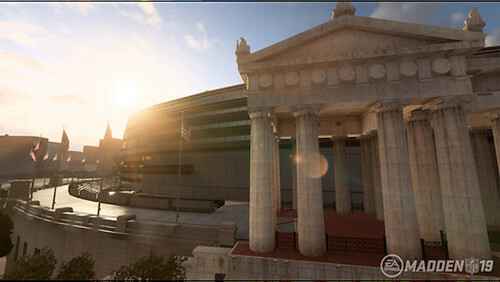 This year the game will release in early August. More specifically, August 2 for EA Access members, HOF Edition on August 7, and the Standard Edition on August 10. 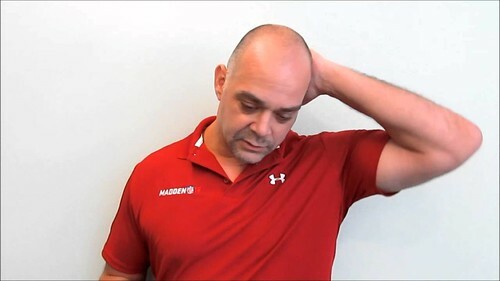 The move extends Madden away from a busy fall release calendar and titles such as NBA 2K19, Red Dead Redemption 2, Battlefield V, and Call of Duty: Black Ops 4. 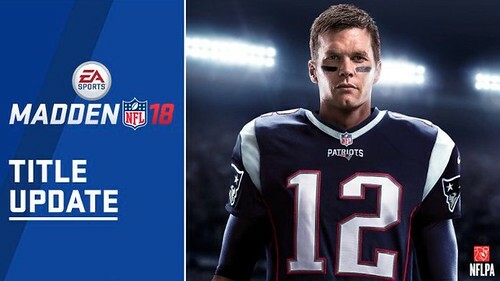 The official press release from EA SPORTS and the Madden NFL 19 website provide the first M19 game details. 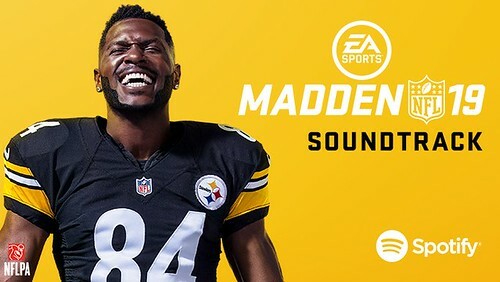 Among the noted features: Real Player Motion Technology, selection of schemes and the ability to create Custom Draft Classes in Franchise Mode, and Player Upgrades and MUT Solo Battles in Madden Ultimate Team. Via his Twitter account, Rex Dickson has announced he has left his role of Creative Director on the Madden NFL franchise. Game update 1.13 is now available for Madden NFL 18 and addresses the Target Passing Exploit that has emerged during the course of the year. Madden NFL 18 game update 1.12 is now available and fixes the broken trade meter in Franchise Mode that emerged following a previous game update. The February title update is now available for Madden NFL 18. 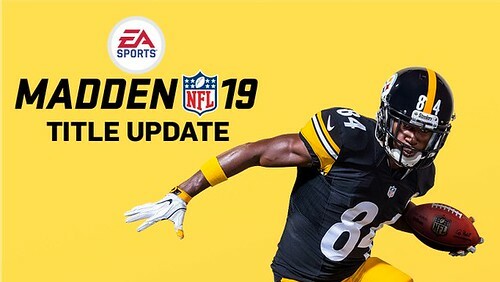 This update focuses on addressing gameplay issues while also adding in Ultimate League content to Madden Ultimate Team. The EA SPORTS Madden NFL 18 Super Bowl LII prediction calls for the New England Patriots to defeat the Philadelphia Eagles 24-20 and repeat as Super Bowl champions. 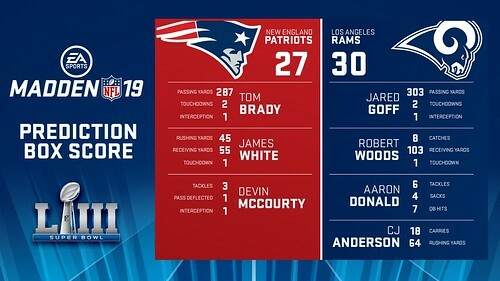 The prediction calls for NE WR Danny Amendola to put the Patriots ahead on a fourth quarter score and for DB Stefon Gilmore to record a pass break-up late to preserve the victory. The simulation also predicts NE QB Tom Brady to win MVP honors. The January Madden NFL 18 title update is now available. Game update 1.09 addresses issues that have arose during the course of previous game updates such as over-effective fake-outs, AI ball-carriers not executing special moves, and a kickoff exploit. Madden NFL 18's December Title Update (1.08) adds 'Audibles on the Fly,' fixes Franchise Play Call screen lag, and improves online stability. Audibles on the Fly allows users to change any formation audible from the Play Call screen during the game. It will also add Custom Audibles to MUT for the first time. 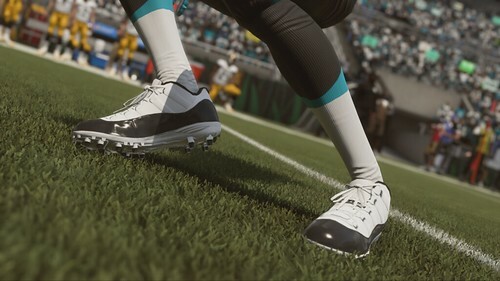 Additional gameplay improvements include additional performance penalties when using defensive players on offense, defenders with the Disciplined penalty trait will not jump offsides when Pass Rush Coach Adjustment is set to Balanced, and an issue around facemask penalties triggering when the Strip Ball Coach Adjustment was set to Conservative has been fixed.